You know what they say – when life gives you lemons… sell them online! Jokes apart, that age old platitude holds a simple lesson of optimism for times when you need it. Some of us, however, prefer to have roadmaps to overcoming challenges and being the best version of ourselves, and for us self-help books can be just what we need to move forward. Packed with wisdom, anecdotes and simple guides, these books are the tools you need to . 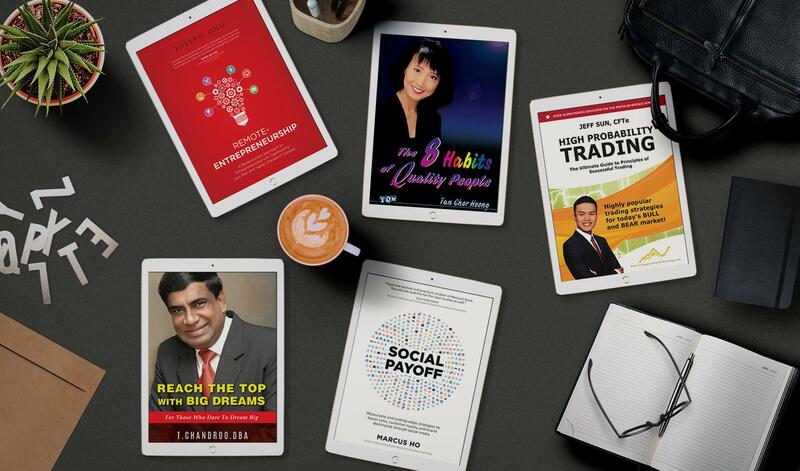 We’ve published a range of ebooks thus far that vary in topics and themes addressed, and this week’s focus is business and leadership. Simply click on the titles to get more information on the ebooks and download them from the ebook store of your choice! Over the years, Dr T. Chandroo, Chairman/CEO of Modern Montessori International Group has always targeted one aspect of his life with a voracious fervour; becoming his own boss. He has never been one to shy away from turning impossible dreams into reality. DREAM BIG he says, over three decades of business, he has journeyed through it all – what it signifies to take risks, surviving against all odds and to stare failure in the eye and learning how to embrace it. He is a big believer that the mind is a powerful tool, where dreams can manifest into reality – if you choose to MAKE IT HAPPEN. Learn how tenacity, endurance and being a trendsetter placed him in a league of his own. Broadly divided into two major parts — the theory and practice of r-entrepreneurship — it chronicles step-by-step the 10-year journey and stunning performance of author Joseph Ong’s real life business “experiment” — One Rochester Group — all while excelling in a multinational company. Readers will appreciate his wisdom, acute observations and practical know-how, and get to learn new exciting terms like Collective Leaders™ (c-Leaders™), Parental Responsibility Over Business (“PROB”), remote-Management System and many more. remote-Entrepreneurship is a revolutionary approach to entrepreneurship that promises significantly less risk and dramatically higher chance of success. This book takes Quality concepts out of the workplace and applies them in the domestic and personal arenas. Drawing on the author’s years of expertise in quality methodology, the content will help you raise your personal effectiveness and productivity. You’ll find yourself empowered to make more meaningful contributions to the communities of which you are a part. You will become a better person, a better parent, a better spouse, a better worker, a better supervisor – in short – you’ll enjoy a better existence. Many businesses get on social media just because they want to be on the bandwagon. With the fast-changing nature of social media, most businesses forget to set clear objectives and have already spent lots of money on advertising to get fans and plenty of engagement. Yet, such results are not leading to a positive impact on the bottom-lines of businesses. With the most measurable and cutting-edge strategies inside, Social Payoff tells you how to reach customers effectively and how to build valuable relationships that will shape the future of your business. This book will show you the ins and outs and ups and downs of short term trading. You’ll learn when to buy and sell stocks, and achieving an overall profitable portfolio at the end of every month, through the use of High Probability Trading strategies. Filled with practical advice, this invaluable book is ideal for new and current traders wanting to improve their trading performance. Strategies in the book are applicable not only to equities, but also indices, commodities and forex trading.